William Jefferson "Bill" Clinton (born William Jefferson Blythe III; August 19, 1946) is an American politician and humanitarian activist who served from 1993 to 2001 as the 42nd President of the United States. He was 46 years old when he was elected and the third youngest president. He took office at the end of the Cold War. Clinton was the first president from the baby boom generation. Clinton was also the second president to be impeached. He was impeached in 1998. Before he was president, Clinton was governor of Arkansas from 1979 to 1981 and 1983 to 1992 and attorney general of Arkansas from 1977 to 1979. He is married to Hillary Rodham Clinton who was the 67th United States Secretary of State from 2009 to 2013 and Senator for New York from 2001 to 2009 and was the Democratic nominee for President in the 2016 US Presidential elections. Clinton was born William Jefferson Blythe III in Hope, Arkansas. His biological father, William Jefferson Blythe. Jr died in a car accident, three months before Clinton was born. His mother, Virginia Clinton Kelley was a Nurse anesthetist. He took the last name Clinton because it was his stepfather, Roger Clinton, Sr.'s name. Clinton grew up in Hot Springs, Arkansas. In high school, Clinton played the saxophone. Clinton went to college at Georgetown University. During his college years, Clinton worked under several politicians. He later went to Oxford University and Yale Law School. Clinton did not fight in the Vietnam War because he was in the ROTC for a short time. Clinton married Hillary Rodham in 1975. In 1980, their daughter, Chelsea Clinton, was born. After law school. Clinton was elected Attorney General of Arkansas in 1976 and governor of Arkansas in 1978. At 32, he was the youngest governor in the country at that time. Clinton was governor of Arkansas from 1979 to 1981 and again from 1983 to 1993. Clinton was known for being a "New Democrat" while governor. During his time as governor, Clinton changed the state's school system. There was also a scandal called Whitewater during Clinton's term. In the 1992 presidential election, he beat Republican George H. W. Bush. During the early part of Clinton's first term, he put in place a tax code which would increase taxes on the rich. In 1994, during Clinton's first term in office, the Congress switched to a Republican majority. However, Clinton still beat Republican Bob Dole in the 1996 election. The Republicans defeated Clinton's proposal for the U.S. government to adopt universal health care. The Republicans proposed many new ideas to Congress to limit the size of government such as requiring the budget to be balanced and to stop people from abusing the welfare system. Clinton was sued by Paula Jones for sexual harassment, but the lawsuit was officially dismissed after Jones failed to prove damages. This made him the first sitting United States president to be sued. 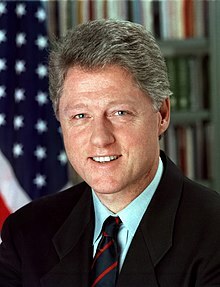 President Clinton was accused of wrongdoing by the U.S. House of Representatives in December 1998 during the Monica Lewinsky scandal and was impeached. Although he lied that they did not engage in sexual activity, he was found to have done nothing wrong by the U.S. Senate in February 1999. The country faced very few challenges during his term. The Cold War was over and there was very little need for the U.S. military to get involved in the world's affairs, so defense spending was significantly lowered. The economy was doing very well during his term, though there is a debate whether the economy was well because of Clinton's policies or because of the Republicans' policies. The decade ended with the being the first time the United States did not have to borrow money to pay for its budget. Clinton left office with high approval ratings and was succeeded by George W. Bush. After his presidency, he wrote some books and traveled around the world helping out the United States. He is married to former US Secretary of State Hillary Clinton and now lives in New York. He has written My Life, a book about his life, and several other books. Clinton has received two Grammy Awards, both for books he read on tape. He is now the U.N.'s envoy to Haiti. He also became a vegetarian. In 2013, Clinton started following Buddhist meditation to help him relax. On November 20, 2013, he was awarded the Presidential Medal of Freedom, the highest civilian honor of the United States, by President Barack Obama. ↑ Morris, Roger (April 25, 1999). Partners in Power: The Clintons and Their America. Regnery Publishing. ISBN 978-0-89526-302-5. Retrieved August 6, 2009. ↑ Metcalf, Geoffrey M. (November 28, 2002). In the Arena: Geoff Metcalf Interviews with Doers of Deeds. iUniverse. ISBN 978-0-595-25752-2. Retrieved August 6, 2009. ↑ Baker, Peter (14 November 1998). "Clinton Settles Paula Jones Lawsuit for $850,000". Washington Post. Retrieved 23 February 2016. The case . . . made him the first president ever interrogated under oath as a defendant in a civil lawsuit. . .
↑ "Latest news | Clinton impeached". BBC News. 1998-12-19. Retrieved 2010-08-14. ↑ "Special Report: Clinton Accused". Washingtonpost.com. 1999-02-13. Retrieved 2010-08-14. ↑ Reader's Digest. December 2010. ↑ "Chill Bill: Clinton turns to the art of Buddhist meditation to relax". Retrieved March 6, 2013. Wikimedia Commons has media related to Bill Clinton.